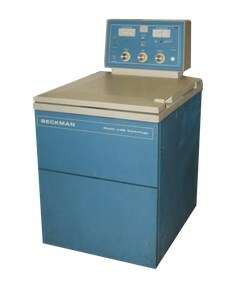 The Beckman J6-B High Capacity Centrifuge features an extensive list of functionalities including a conventional brush motor and reliable analog display. It also features an advanced refrigeration option, a performance speed of 6000 rpm, and a maximum force of 6835 g.
Beckman J6B wont start a run- Door latch, brushes, belt, timer, all OK. drive moves freely. Start button illuminates for about 10 seconds, then goes out. When the timer gets to zero the motor stops and the speed slows down about halfway then the motor powers up again and it keeps running even though the timer is on zero. I tried another timer and it does the same thing. It is possible to get service manual for Beckman model J-6B? There are no threads in Beckman Coulter J6-B Reviews at this time.